Look narrowly at the causes or excuses for defection. Why do they renounce the religious profession they once espoused? The fundamental reason is a want of grace, a lack of true faith, an absence of vital godliness. It is, however, the awkward reasons that expose the heart’s inward apostasy from Christ of which I am anxious to treat. Some there are in these days, as there were in our Lord’s own day, who depart from Christ because they cannot bear His doctrine. There are many points and particulars in which the gospel is offensive to human nature and revolting to the pride of the creature. 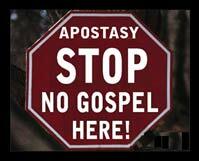 Unsound doctrine occasions many to apostatize. They begin cautiously by reading works with a view to answer scientific or intellectual skepticism. They read a little more and dive a little deeper into the turgid stream, because they feel well able to stand against the insidious influence. They go on, till at last they are staggered. They do not repair to those who could help their scruples, but they continue to flounder on till at last they have lost their footing, and he that said he was a believer has ended in stark atheism, doubting even the existence of God. Oh, that those who are well taught would be content with their teaching? Why meddle with heresies? What can they do but pollute your minds? Keep to the study of the Word of God.